I grew up fishing on the Manukau Harbour in Auckland when at 8 years old I knew I was developing a passion for fishing, out on the water at every opportunity in the families 6ft Pram dingy with 2HP Seagul engine. From Childhood in Onehunga, Auckland and always tinkering with engines and all things mechanical I gained an A Grade Auto Mechanic ticket specialising in custom blueprinting car engines and also working on high-pressure gas compressors all over NZ. I then gained my Launch Masters ticket in 1988 and also went on to manage a leading retail fishing Tackle Store in central Auckland for 7 Years. So far I have caught and released 16 marlin Solo including one Broadbill Swordfish from my trailer boat in Doubtless Bay and Skippered 5 Offshore Adventures to the Chesterfield Atolls, New Caledonia. also have fished all over the Pacific for inshore and offshore species, always testing my work to the maximum. Deciding to work for myself in 2002, enabling me to have more time on the water testing the reel upgrades I had been working on and working with others passionate about fishing, serious fishermen looking for personal professional service from someone who cares about Reel Service. 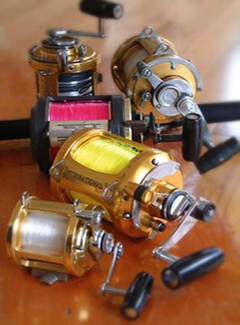 I really enjoy upgrading your reels performance & custom tuning them to run better than New!